The Black Keys hail from Ohio, consists of the duo Dan Auerbach (on guitar and vocals) and Patrick Carney (on drums) and formed in 2001. The blues-rock duo the Black Keys have been described by Rolling Stone as "... a two-man combo with a big-band mind." May 20: The Black Keys released their debut LP The Big Come Up. The LP, recorded in Carney's basement, contained the track "I'll Be Your Man" which later became the theme song for the TV series Hung. April 8: The Black Keys released Thickfreakness. The LP was recorded in Carney's basement in 14 hours. January 19: The Black Keys released the EP The Moan. September 7: The Black Keys released Rubber Factory. Various songs on the LP could be heard on commercials and films. The LP was recorded in an abandoned factory. May 2: The Black Keys released the tribute EP Chulahoma: The Songs Of Junior Kimbrough. September 12: The Black Keys released Magic Potion. April 1: The Black Keys released Attack & Release. The LP was a part of Rolling Stone's greatest albums of the 2000s list. October 17: The Black Keys performed at a benefit concert in Ohio for presidential candidate Barack Obama. February 10: Auerbach released a solo LP Keep It Hid. September 29: Carney formed the band Drummer who released the solo LP Feel Good Together. November 27: The Black Keys released the rap-rock collaboration LP Blakroc (available for download at Amazon-mp3). The LP hit the Top 10 on the Billboard Rap Albums chart. May 18: The Black Keys released Brothers. The LP hit the Top 10 in the US, Australia, Canada, and New Zealand. June 5: The Black Keys topped the Billboard Rock Albums chart for 1 week and Alternative Albums chart for 1 week with Brothers. September 12: The video for "Tighten Up" won a MTV Video Music Award for Breakthrough Video. November 6: The Black Keys topped the Billboard Alternative Songs chart for 10 weeks with "Tighten Up." November 27: The Black topped the Billboard Rock Songs chart for 12 weeks with "Tighten Up." January 6: Brothers was certified gold. January 8: The Black Keys performed "Howlin' For You" and "Tighten Up" on Saturday Night Live. February 13: The Black Keys won 2 Grammy Awards for Best Rock Vocal Performance by a Duo or Group ("Tighten Up") and Best Alternative Music Album (Brothers), and were nominated for Best Rock Instrumental Performance ("Black Mud") and Best Rock Song (songwriters for "Tighten Up"). August 28: The video for "Howlin' For You" was nominated for a MTV Video Music Award for Best Rock Video. November 20: The Black Keys were nominated for an American Music Award for Favorite Alternative Artist. December 3: The Black Keys performed on Saturday Night Live. December 6: The Black Keys released El Camino. December 17: The Black Keys topped the Billboard Alternative Songs chart with "Lonely Boy." December 24: The Black Keys topped the Billboard Rock Songs chart with "Lonely Boy." December 24: The Black Keys topped the Billboard Digital Albums chart, Rock Albums chart, and Alternative Albums chart with El Camino. January 18: El Camino was certified gold. February 12: The Black Keys were nominated for a Grammy Award for Best Pop Duo/Group Performance ("Dearest"). April 9: Brothers was certified platinum. June 9: The Black Keys topped the Billboard Alternative Songs chart with "Gold On The Ceiling." September 6: The video for "Lonely Boy" was nominated for a MTV Video Music Award for Best Rock Video. October 4: El Camino was certified platinum. November 18: The Black Keys were nominated for an American Music Award for Favorite Alternative Artist. December 31: The Black Keys topped the Billboard 2012 Year-End Chart-Toppers chart as the Top Rock Songs Artist, Top Alternative Songs Artist, and with the Top Rock Song ("Lonely Boy"). February 10: The Black Keys won 3 Grammy Awards including Best Rock Song (awarded to the songwriter) and Best Rock Performance ("Lonely Boy"), and Best Rock Album (El Camino), and were nominated for Album of the Year (El Camino) and Record of the Year and Best Rock Performance ("Lonely Boy"). Auerbach also won for Producer of the Year. February 20: The Black Keys won a Brit Award for International Group. May 10: The Black Keys performed on Saturday Night Live. May 13: The Black Keys released Turn Blue. May 24: The Black Keys topped the Billboard Alternative Songs chart with "Fever." May 31: The Black Keys topped the Billboard 200 LP chart for 1 week, Digital Albums chart, Rock Album chart, and Alternative Albums chart with Turn Blue. The LP sold over 164,000 copies its first week of release in the US. August 24: The video for "Fever" was nominated for a MTV Video Music Award for Best Rock Video. November 1: The Black Keys topped the Billboard Adult Alternative Songs chart with "Gotta Get Away." December 31: The Black Keys topped the Billboard 2014 Year-End Chart Toppers chart as the Top Adult Alternative Songs Artist and with the Top Adult Alternative Song ("Fever"). February 8: The Black Keys were nominated for 3 Grammy Awards including Best Rock Performance and Best Rock Song (awarded to the songwriter) ("Fever"), and Best Rock Album (Turn Blue). May 25: Attack & Release was certified gold. February 24: Turn Blue was certified gold. 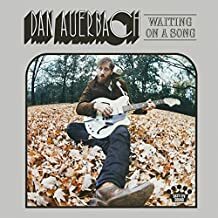 June 2: Auerbach released the solo LP Waiting On A Song. July 8: Auerbach topped the Billboard Adult Alternative Songs chart with "Shine On Me." April 17: Brothers and El Camino were certified 2x platinum. Tracks: "Busted" - "Do The Rump" - "I'll Be Your Man" - "Countdown" - "The Breaks" - "Run Me Down" - "Leavin' Truck" - "Heavy Soul" - "She Said, She Said" - "Them Eyes" - "Yearnin'" - "Brooklyn Bound" - "240 Years Before Your Time"
Tracks: "Thickfreakness" - "Hard Row" - "Set You Free" - "Midnight In Her Eyes" - "Have Love Will Travel" - "Hurt Like Mine" - "Everywhere I Go" - "No Trust" - "If You See Me" - "Hold Me In Your Arms" - "I Cry Alone"
Tracks: "When The Lights Go Out" - "10 A.M. Automatic" - "Just Couldn't Tie Me Down" - "All Hands Against His Own" - "The Desperate Man" - "Girl Is On My Mind" - "The Lengths" - "Grown So Ugly" - "Stack Shot Billy" - "Act Nice And Gentle" - "Aeroplane Blues" - "Keep Me" - "Till I Get My Way"
Tracks: "Keep Your Hands Off Her" - "Have Mercy On Me" - "Work Me" - "Meet Me In The City" - "Nobody But You" - "My Mind Is Ramblin'"
Tracks: "Just Got To Be" - "Your Touch" - "You're The One" - "Just A Little Heat" - "Give Your Heart Away" - "Strange Desire" - "Modern Times" - "The Flame" - "Goodbye Babylon" - "Black Door" - "Elevator"
Import Edition includes: "Breaks" - "Thickfreakness"
Tracks: "All You Ever Wanted" - "I Got Mine" - "Strange Times" - "Psychotic Girl" - "Lies" - "Remember When (Side A)" - "Remember When (Side B)" - "Same Old Thing" - "So He Won't Break" - "Oceans & Streams" - "Things Ain't Like They Used To Be"
Tracks: "Everlasting Light" - "Next Girl" - "Tighten Up" - "Howlin' For You" - She's Long Gone" - "Black Mud" - "The Only One" - "Too Afraid To Love You" - "Ten Cent Pistol" - "Sinister Kid" - "The Go Getter" - "I'm Not The One" - "Unknown Brother" - "Never Gonna Give You Up" - "These Days"
Tracks: "Lonely Boy" - "Dead And Gone" - "Gold On The Celing" - "Little Black Submarines" - "Money Maker" - "Run Right Back" - "Sister" - "Hell Of A Season" - "Stop Stop" - "Nova Baby" - "Mind Eraser"
Tracks: "Weight Of Love" - "In Time" - "Turn Blue" - "Fever" - "Year In Review" - "Bullet In The Brain" - "It's Up To You Now" - "Waiting On Words" - "10 Lovers" - "In Our Prime" - "Gotta Get Away"
Note: Song title and position links lead you to the song's ARC Weekly Top 40 chart run, LP links take you to Amazon.com for that LP's info (often including track listings and track samples), and single cover art takes you to Amazon.com for that CD single (if available).